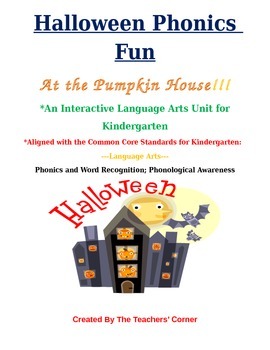 Common Core Language Arts -- Halloween Phonics Fun at the Pumpkin House! Common Core Language Arts -- Halloween Phonics Fun at the Pumpkin House! is a kindergarten phonics and word recognition set of activities. These activities are based on the use of CVC Words with a Rhyming Pattern and focuses on the common core area of phonological awareness as well as word recognition. This Unit will have your students practicing the recognition of CVC words which follow these rhyming patterns: -ap, -at, -ad, -ag, -am, -an, -et, -ip, -og, -un. Halloween Phonics Fun at the Pumpkin House! 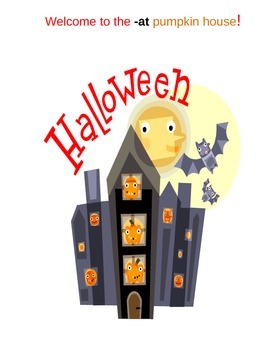 follows the same format as our Phonics Fun on the Farm Series of Units...except that the provided illustrations differ due to the fact that we focus on the illustrations of Halloween for this set of particular activities. The first part of the ten Language Arts Activities will each contain a box of the letters of the alphabet for students to cut out and use on each activity page. Along with these cut-out letters, pictures of CVC rhyming words and a part of the word itself that matches each picture will be given on each page. The word presented will have its beginning letter missing; and the same _VC pattern will be practiced by the students on each page. Example: _ap words on one page, _ip on another, etc. The second part of the Language Arts Activities within the Unit will present a pumpkin house mat for each activity: a picture of a house of pumpkins in which students will glue, tape, or Velcro (if the pumpkin house mat is laminated) the CVC pictures along with their completed CVC words from the page before anywhere on the Mat. 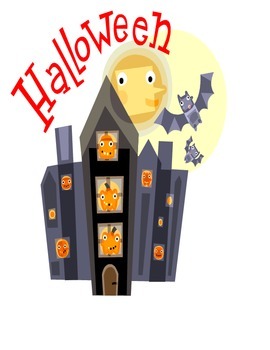 Students will also have the opportunities to “illustrate” their Pumpkin House Mats by using the Halloween paper illustrations provided at the end of this Unit. Students will cut and paste/Velcro these paper figures onto their Mats as well. This part of the activity will be quite fun for your students since they can individualize their Pumpkin House Mats through their own imaginations! ClipArt provided by www.mycutegraphics.com and Microsoft Word. inservices, professional development courses, educational conferences, peer collaborations, and just everyday on-the-job experiences with our students, our parents, and our peers!